Saturday 15th August 2020 | 10am – 5pm, Bangalow Showgrounds | Get Map Directions! Entry to the Pickers Comp is free for pickers, and you get complimentary entry to the Festival! Pickers Comp Entry – Free! BYO Instrument! The Pickers Comp is a way to showcase some of the great musicians that are hiding in the hills and vales of our great Northern Rivers region. We know you don’t get much of a chance for a showing, so this is your chance to share the stage with some of this countries best Bluegrass talent and get noticed. This region has an amazing array of musical talent, so we’d like to show some of that off! Enter the competition today and show us what you’ve got! It’s a great day of music and BBQ for everyone! Guitar (flat picked – 6 string – standard tuning – capo is allowed). 2. Heats will be run in between band performances throughout the day – 3 contestants per heat – and as many heats per category as necessary. If you win your heat, you go through into the finals. Winners of the finals go into the Grand Final. The Grand Final will consist of the winners of the finals for each category. This means there will be 4 Grand Finalists, each on a different instrument. 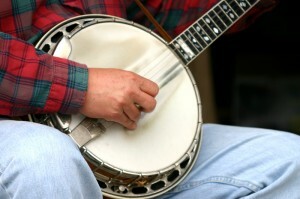 If the same contestant wins more than one category, they must select their preferred instrument to enter the Grand Final with. The category(s) they don’t select will see the runner-up compete. 3. During a heat or a final, each of the three contestants will twice play a 16 bar instrumental ‘solo’ over a pre-arranged ‘standard’ progression, played live by the house band (guitar and upright bass). These tracks are available for streaming or download on Soundcloud (www.soundcloud.com/bbqbluegrass). Competitors have the ability to establish knowledge of their relevant backing track and prepare accordingly. All contestants will play for the same amount of time over the same backing track (played live by the house band). 5. Performers will be gathered (standing) around a single condenser mic. Each player will step to the mic in turn to perform their piece and step away at the end of their piece. There will be no gaps between performances in the heat. One piece runs into the next and around it goes until the heat is over. In the semi-finals, the track will go around twice, with each performer playing 2 x 16 bar instrumentals. The Grand Final will see 3 x 16 bar performances from each contestant. There will be an 8 bar introduction for each round, then no more gaps until the round concludes. 6. All contestants are required to assemble at the marshalling area at 9am sharp on the day for briefing. This area will be inside the festival grounds and will be made obvious on the day. 8. This festival is all about having a great time. The objective is to have fun and play music alongside some great musicians to a supportive and excited audience. It is a competition, but it’s also a show. People love this music because of the human interaction that it evokes. Just have a great time and enjoy the experience! Register to Learn More About Comp! Register your interest today and we’ll send you the full Rules and Regulations by email.